Contra Dance — Friday, May 31, 2013 — introducing our newest callers! River Ridge String Band plays old-time, traditional, folk, celtic, bluegrass, and country music throughout the mid-Missouri area. Don’t miss this Friday’s dance. We are very lucky to have River Ridge String Band playing for us this week. 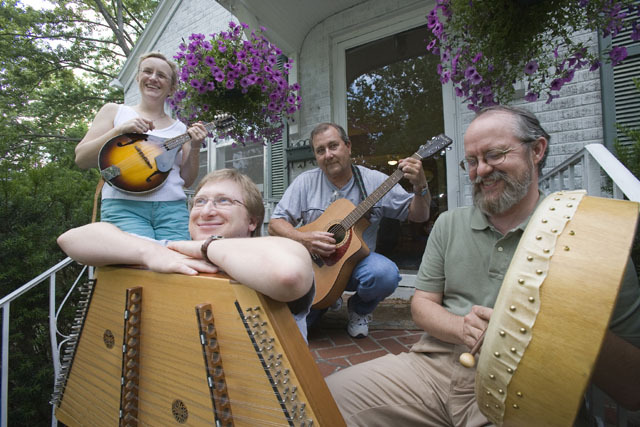 River Ridge is made up of Cliff White on hammered dulcimer, Molly White on mandolin, Charlie Nelson on guitar, and John Cummings on percussion and banjo. They are fine musicians with a wonderful driving sound. We are also in for another treat! This dance is the debut of several new callers who have honing their skills at various Calling Parties over the past year, under the guidance of master caller Jim Thaxter. These individuals have worked hard to get ready for this dance, so come and welcome them to our circle of callers! The dance will be at the usual time and place: 7 pm lessons, dance 7:30 to 10:30 pm at the First Christian Church, corner of 10th and Walnut in downtown Columbia, north entrance under the driveway canopy. The dances start easy and become somewhat more difficult (but not impossible) as the evening progresses, so if you’re a beginner, come early. All dances are taught and no partner is necessary. Please wear clean soft-soled shoes to protect our gorgeous wooden floor. And most importantly, have fun! Children 15 and under: free (as always); ages16-25 and students of any age with ID: $4; 26 and older: $7, a bargain! This entry was posted in Callers Jam, Contra Dances. Bookmark the permalink.